VATICAN CITY (CNS) — Today, more than ever, the world needs a revolution of tenderness, Pope Francis said. “Far from being reduced to sentimentalism, tenderness is the first step in overcoming the withdrawal into oneself, to emerge from the self-centeredness that ruins human freedom,” he said Sept. 13. “God’s tenderness leads us to understand that love is the meaning of life,” said the pope, speaking with people who were to take part in the conference, “Pope Francis’ Theology of Tenderness,” in Assisi, Sept. 14-16. The Catholic faith “inextricably” binds together tenderness and theology, which is called “to communicate the concreteness of God (as) love,” he said. 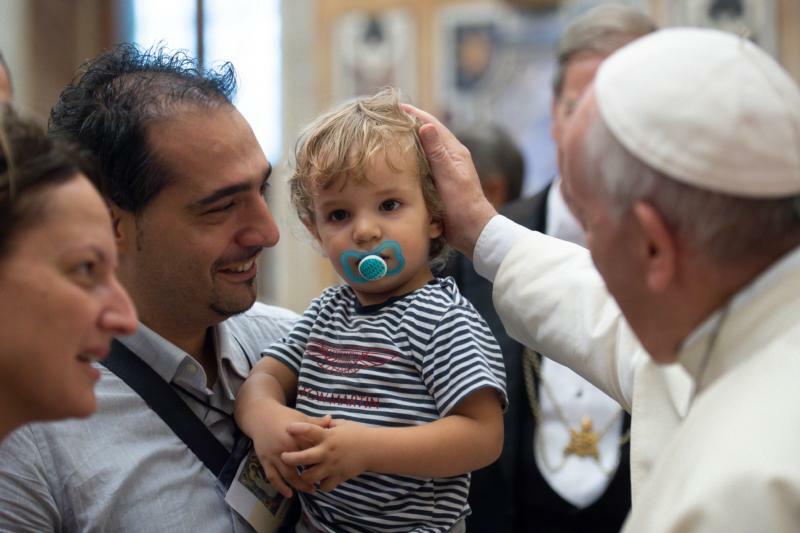 A theology of tenderness, the pope said, expresses “the beauty of feeling loved by God” and the beauty of feeling the need to love others in God’s name. “Whatever happens, whatever we do, we are sure that God is near, compassionate, ready to feel moved by us,” he said, because God loves his children. “We feel called to pour onto the world the love received by the Lord, to offer it in the church, in the family, in society, to join it in serving and in giving ourselves,” while is all done “not out of duty, but out of love,” he said.